If you think your pet has been exposed to a poisonous substance please contact us right away at (818) 882-6111. The ASPCA Animal Poison Control Center may also help at (888) 426-4435. It may save your pet's life. Balconies - Tall balconies without safety railings, or railings spaced too far apart, can lead to a dangerous fall. Doors and windows - Dogs and cats can run away if they find an open door or window. They can also get seriously injured if they run across a busy road. Windows should have screens to prevent cats or other pets from falling out. Electrical cords - Your pets can be electrocuted if they bite or chew on electrical cords that are plugged in. Fireplace - Your pets can be burned by the flames or get sick if they eat the ashes. Toilets - Toilet water is not healthy for pets to drink; always remember to close the lid. Make sure you leave plenty of clean, fresh water for your pets if you must leave them home alone. Washer and Dryer - Your pets can crawl into a washer or dryer without your knowledge; close the doors to these appliances when you're not using them. Algae* - Can be found in ponds or other bodies of water; certain forms can be toxic. Antifreeze/Coolant* - Some types of antifreeze or coolant products contain ethylene glycol, which is highly toxic to dogs and cats, even in small amounts. Fire pit/Grill - Flames can result in serious burns and ashes can cause illness if ingested. Fences or Gates - Your pets can run away if they find openings in damaged fences or gates. They can also get hurt or strangled if they get stuck. Deck lattice - Your dogs or cats can get stuck in the openings under your deck and possibly be strangled. De-icing salts - Some formulations may contain chemicals that are hazardous to pets if ingested in large amounts. Look for pet-friendly de-icing salts. Swimming pools and hot tubs - Never leave your pet unattended near uncovered pools, even if they can swim. Flowers and candy - Many types of flowers and plants found in bouquets are harmful to dogs and cats if they are ingested (see list of hazardous plants above). Chocolate can cause vomiting, diarrhea, hyperactivity, abnormal heart rhythm, tremors and seizures, and, in severe cases, chocolate poisoning can be fatal. Fake grass - This colorful grass may look appetizing to your pets, but it could cause them to choke or obstruct their intestines if ingested. Small toys and other plastic items - If swallowed, small toys and plastic Easter eggs can cause your pet to choke or even damage their intestinal tract. Repeatedly opening doors to greet trick-or-treaters can increase the chances of your pets running out. Keep an eye on their whereabouts at all times. 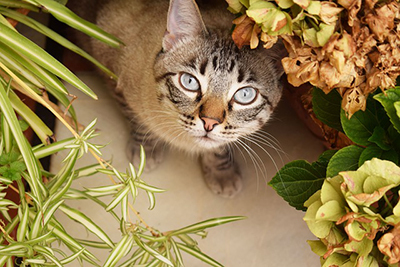 If feasible, keep cats in a secure area or closed room when opening doors. Candles - Pets are naturally curious, and may be attracted to the bright lights of the flame in dark areas. Dogs and cats could either burn themselves by the flame or knock the candle over, starting a fire. All forms of chocolate can be harmful to your pet, potentially resulting in poisoning or even pancreatic inflammation from the high fat content. Fire salts - Contain chemicals that could be harmful to your pets. Ornaments - These can look like toys to cats and dogs, but they can cause serious injury, especially if your pets break or swallow them. Loud noises - New Year's is typically a noisy holiday. Unfortunately, loud noises frighten pets and can cause them to run off. Keep your pets in a separate room, away from noisemakers, music, and other loud sounds that may startle them.